You don’t get many literary recommendations from me, but this is one publication that no one should be without – The Modern Drunkard by Frank Kelly Rich is a collection of the best bits from his bi-monthly periodical of the same name. Together they form a comprehensive and instructive manual on how to drink-and how to do it well. 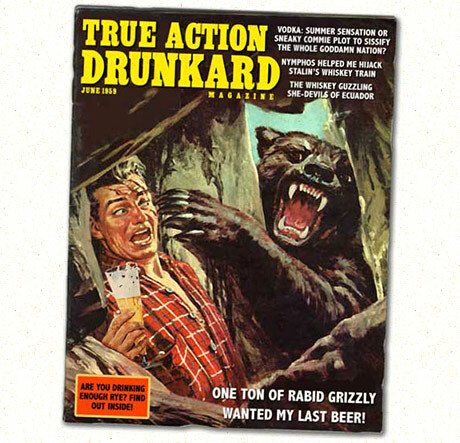 Check out the Modern Drunkard site to get a feel for what you can expect from the book. Be sure to read 40 things everything a drunkard should do, as Frank puts it –a man is, ultimately, the sum of his accomplishments. And or course the 86 Rules of Boozing, with such gems as “If there is ever any confusion, the fuller beer is yours” and “If you have been roommates with someone more than six months, you may drink all their beer, even if it’s hidden, as long as you leave them one”. Good work Frank. Jan 12	This entry was posted in Drinking, Funny, Stuff to Buy by cookie. Bookmark the permalink.